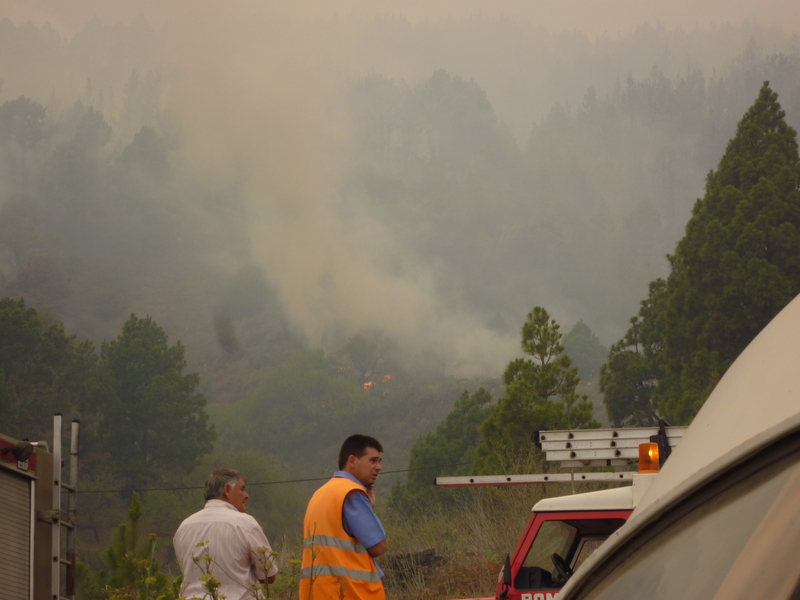 The image is from the wildfire La Palma island, concretely in Mazo town. The wildfire burned more or less 2000 Ha in the island out of 73000. It was close to several houses for moments as seen in the image taken from the main road of the island. In any case it was much better than the wildfire in nearby island La Gomera which lasted for two weeks and burned more than 10% of the land.There were two more in Tenerife. Most of them were human caused, but climate change played a role with an extremely dry year, making very difficult fire extinction work. Some places in La Palma were really dry without rain in almost a year. To help even more a heat wave came to La Gomera adding more fuel to the flames. Those fires did not come from the climate but it helped to make them greater and more dangerous. In the future it can be even worse. Who will pay for the firefighters bills in the future and the increment of their need? Will fossil fuels contribute is some amount to this bill, or will be just for everybody?